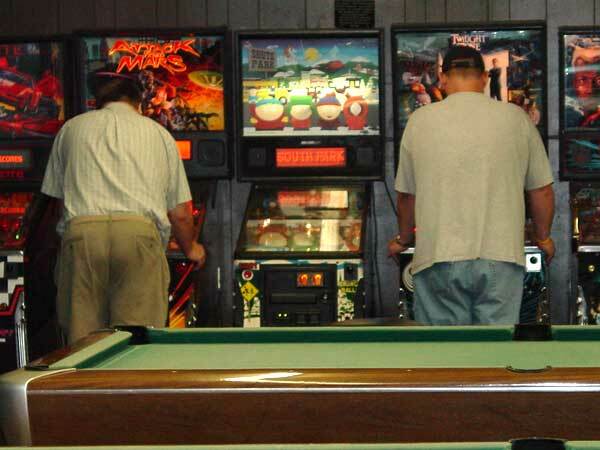 On Saturday July 16th, the TCFPA had its second annual mid-year pinball tournaments at SS Billiards in Hopkins, MN in the USA. 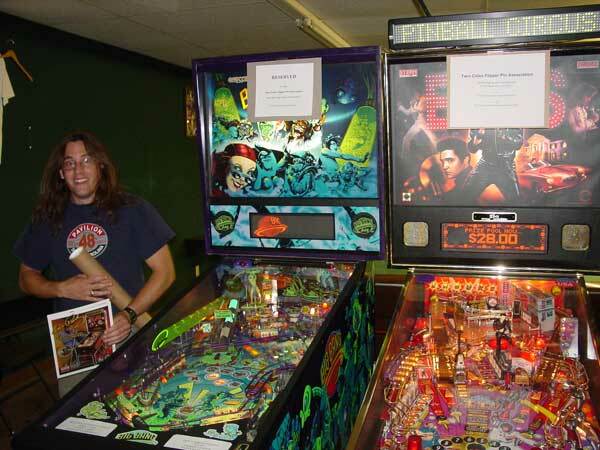 On Saturday, August 21st - 2004, the TCFPA had its first official mid-year pinball tournaments. 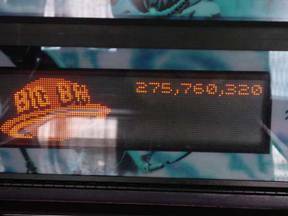 This year's mid-year pinball tournaments were the same format as the previous year's mid-year tournaments. Along side regular league, we had a one day high score tournament. 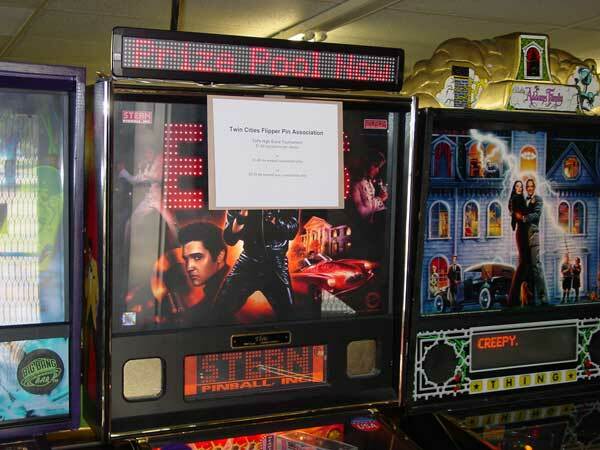 On top of that and just for the TCFPA, Lloyd ran a one day high score tournament on both of his s ToPS games, “Elvis®” and “The Lord of the Rings”. As with last year's mid-year pinball tournaments, I had to get prizes for the winners. Though I had a few prizes left over from last year's events, I didn't have enough for what I was planning. I asked several people in the industry for help. The following people were placed on the TCFPA's “Event Sponsor's” page, of the TCFPA site, for donating prizes. Martin of "Pinball News", donated the coolest pinball shirts that I have ever seen. 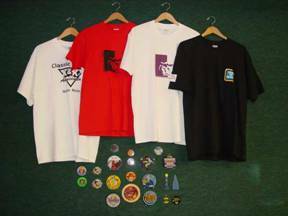 Kevin Ketchum, of "K & K Amusement - Classic Arcade", donated cool "PaTZ " T-shirts. I had some left over flyers from Mike Pacak of “Pinball Expo” fame. Though the events were all open to the public, Lloyd, of "SS Billiards", hosted us. In doing so, Lloyd risked alienating some of his regular customers, especially his billiards playing customers. Shirts from K & K and PBN . Fobs from Mike Flyers from Mike and certis from TCFPA. 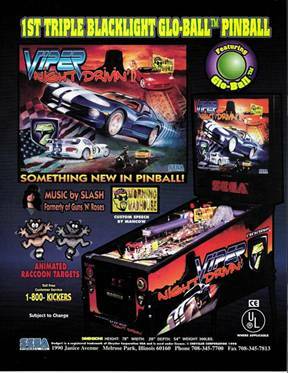 Everyone who registered for any event received a free and collectable “Viper Night Driving” pinball flyer. 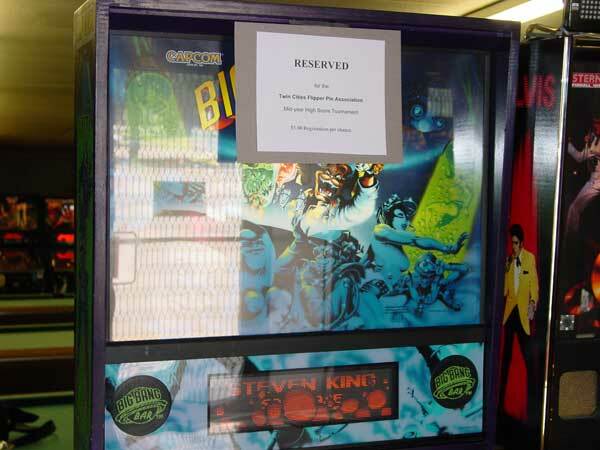 League was run as normal; three pinball machines were chosen at random and each machine was played twice. Kevin was the first person to register for league. Kevin was awarded choice of pinball plastics for his early efforts. Kevin wanted to be pictured playing “BBB”. The TCFPA league started at 7:00 PM and was the first event to finish. The randomly chosen games were: "Attack from Mars", "Eight Ball Deluxe Limited Edition", and "Dracula". I have to admit that I had a very good start with over 9+B on "Attack from Mars". But, Terry W had an even better start with over 13B on the same round of the same game. Terry's high scores earned him the maximum of 7 points, for each of his two rounds, on "Attack from Mars". Terry earned 33 points total. This was comfortably more than my 27 points. For the TCFPA mid-year tournaments only, Terry won a larger than normal prize package. The package included a special certificate of high score from the TCFPA. 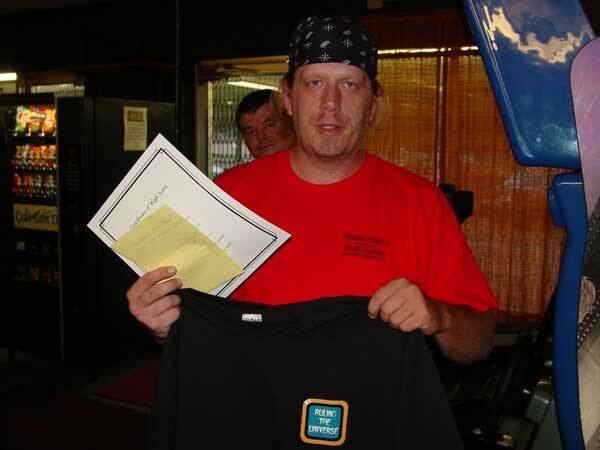 He won a $20.00 gift certificate for the "EZ Foods Deli". He was also awarded a set of 12 different pinball flyers. He had is choice of pinball plastic sets. And, a set of 6 collectable tokens. For this special event only, Terry had pick of pinball shirts. Without hesitation, he chose the shirt from "Pinball News". Wearing his October 2nd, 2004 Pinball Circus shirt, Terry is pictured with his new shirt, courtesy of Pinball News. Like the TCFPA high score tournament, Lloyd had one-day tournaments on his ToPS games, “Elvis®” and “The Lord of the Rings”. These tournaments ran from noon till midnight. Registration was $5.00 per attempt on both of these games. 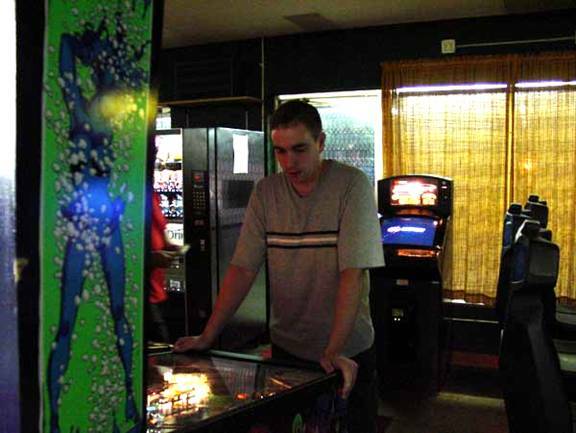 $1.00 from each attempt went to “feed” the pinball machines, set on tournament play. And, the other $4.00 went into the jackpot for each game. These were the next events to finish. One of Lloyd's ToPS games, “LoTR”. Jesse was the first person to register for this one day high score tournament. 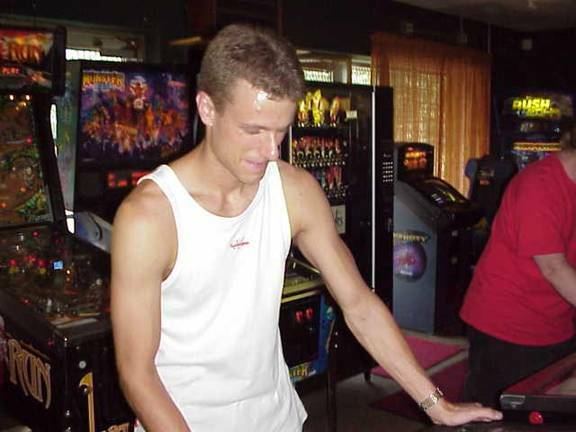 Therefore, he was the first person to get a high score, with 85+M points. Jesse was rewarded for his efforts. Jesse had first pick of plastics sets. He chose a collectable “Indiana Jones” key fob and coaster set. Jesse, first in line and first on the board. 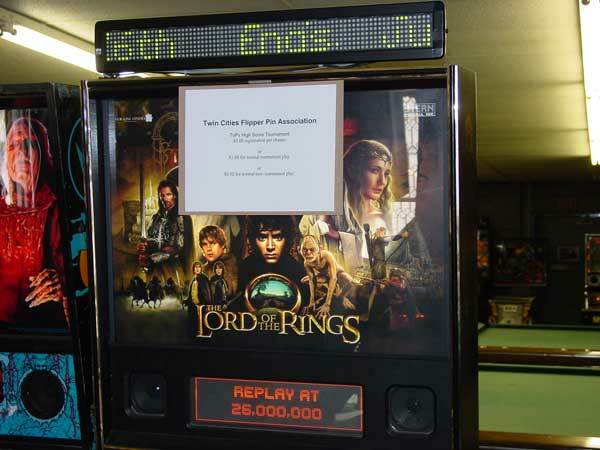 Ten attempts were made for the highest score on “ LotR ”. When this event ended, Terry W took honors and the majority of the collected fees, $30.00 for winning 1st place. 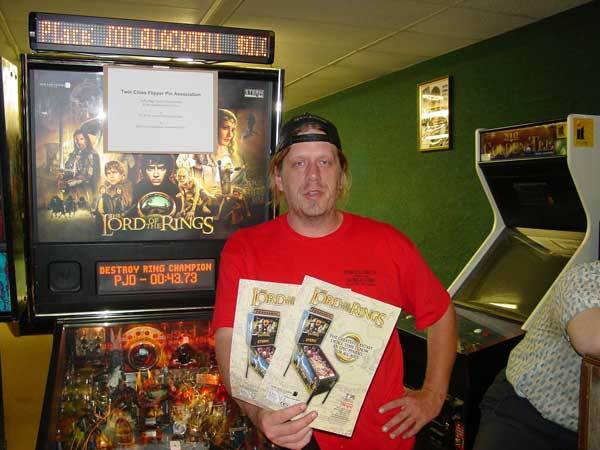 Terry was also awarded two LotR flyers. Derek F.W took home $10.00 of the $12.00 collected for winning 1st place. Derek was also awarded a collectable “Elvis” flyer set. 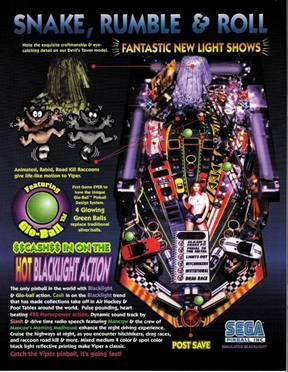 Lloyd's original “Big Bang Bar, from “Capcom”. 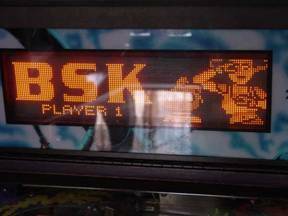 The high score tournament was held on "Big Bang Bar" and was the last event to finish. Registration and competition on “BBB” also started at 12:00pm and was continuous through 12:00am. Brian K. was the first person to register for the TCFPA high score tournament and was awarded a collectable flyers set for his efforts. Brian put up the highest score within the first hour. He scored an impressive 275,760,320 points. Brian's score was unbeatable until three minuets before midnight when Derek F. scored over 500B points. As high score winner for this event, Derek F took home the majority of the registration fees, $26.00. (This was a $36.00 cash total for Derek.) Derek also won a special mid-year TCFPA certificate. And, he had choice of Stern translights. He chose “Rollercoaster Tycoon”. The TCFPA mid-year tournaments provided people with the chance of a break from the local festival. As the temperature outside topped 90 degrees, I thought that the clean, smoke-free, air-conditioned environment and $0.50 game play inside SS billiards would attract families. With the exception of two fathers who brought their sons in for “real pinball”, this was not the case. Though the turnout of people was somewhat poor, the pinball machines performed exceedingly well. The only problem that I knew of for the entire day was a single broken EOS switch on LoTR . Lloyd had the game back in tournament condition in just minutes. After the various pinball events had finished, as was only fair, I helped Lloyd rearrange the pinball machines back to their normal locations. While doing so, Lloyd asked me how I thought the day went. I told him that I didn't know if I could continue running the TCFPA. Lloyd asked me not to make a decision while I was demoralized by the lack of help and low turn out of people. For those who have not realized it, the TCFPA awards people not only for wining; they are also recognized for being an active part of TCFPA activities. All pictures courtesy of Pinball Renaissance - TCFPA. All pictures taken with a Sony 3.3 mega-pixel MVC-CD300 digital still camera set to take fine pitch JPGs in auto mode. 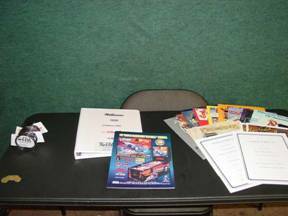 If you wan to learn more about the TCFPA please visit our website . For information on SS Billiards* visit Lloyd's site .